Mine is, except I seem to have zero time for sewing. Or swimming. All I seem to do is feed children. Maybe it's because they're home with me at every single meal (unlike during the school term), and they're constantly hungry. Even just an hour after their last meal. It's like their stomachs are either minuscule and can only hold molecules of food at a time, or their bodies are converting it at breakneck speed, or else they're asking for food simply to keep my attention on them. Are your children the same way, or is it just mine? But busy or not, these are happy days, as they always are when the sun is shining. Never mind the muggy humidity that gives me headaches and limits my outdoor running to the half-hour window just before darkness falls like a blessed cloak upon the sweltering world. Come January, I will be craving this pounding heat. I know it. And I don't look forward to it. However, this post is not just phatic communion about the weather (I just needed to vent)! It is about market research. 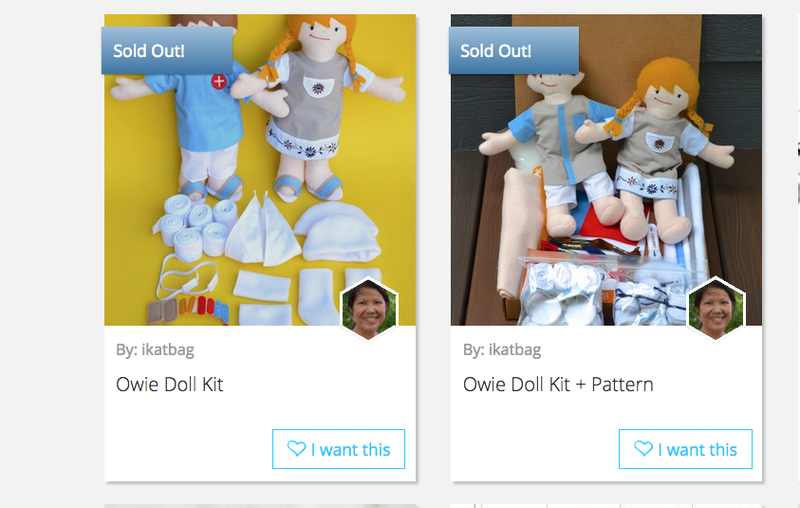 First, thank you all for the overwhelmingly gorgeous response to my Owie Doll kits! 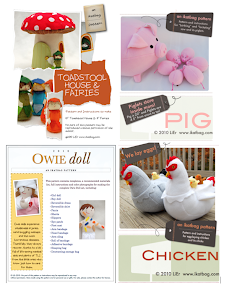 They have completely flown off the shelves and Take&Make and I are thrilled to see them go to new homes so quickly. As promised, in the wake of the good response, we are ready to talk about new skin and hair tones, so you can make dolls to reflect the different ethnicities of the little ones you love. I am so excited! What kinds of colors you'd like. 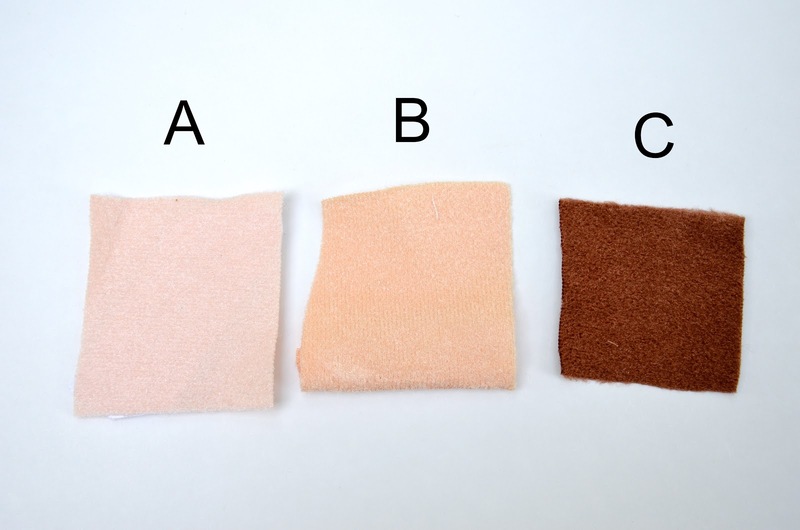 A is the skin tone of the dolls in the first round of kits. It has a pink undertone and I'd say it's the closest to fair Caucasian skin. B is a little more tan. I'd say it's closer to skin that has some yellow in its undertone. C is a rich darkish brown - like the color of cocoa - and the closest to darker skin tones. Sadly, these do not reflect all the wonderful shades that exist in the people of the world, and we will have to make approximations at best. My own skin color, for instance, is neither of those three. For the hair tones, though - being wool felt - we can be a little more varied. We don't know yet what skin/hair combinations will make it to the final kits, or whether we can do custom requests for special combinations, but this is what the market research is for, right? I like polling my readers to get a feel of the real interest out there, so would you be sweet enough to take a 3-question survey for me at the end of this post? 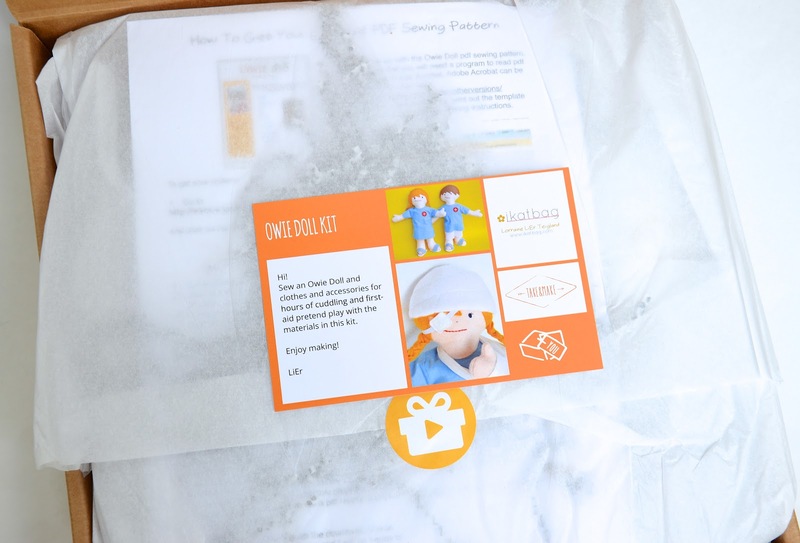 I still get a warm fuzzy feeling whenever I think that it was because of your suggestions to an earlier poll that this Owie Doll kit came to be at all. 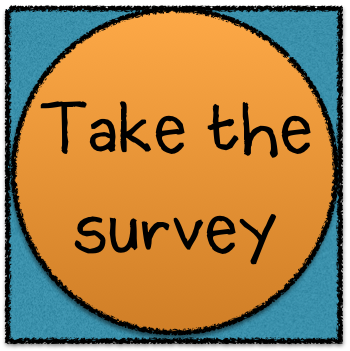 Click on the giant button below to start the survey. Congratulations on your kit sales! Amazing (but not surprising)! I took the survey. But that a quick comment might be in order. I think removable hair/wig option or tutorial might be a good idea. Where I live we see a fair amount of children who are having cancer treatment and hair loss is a big issue. Heather, that's a wonderful idea. And it reminds me that other readers have emailed me to suggest the same thing - they made their dolls bald with a wig, for chemo treatments. I'm going to plan for a tutorial for that - along with IV tubes (another suggestion). Thank you! Wait, so that means I have to wait to buy a second kit? But, I was going to buy another kit so I could make some for my niece and nephew. Noooooo! And by the way I have 3 kids impatiently waiting for me to finish the dolls. They seem to think I can magically finish them in 1 hour or less. The answer to the first two questions completely depends on who I'm making the doll for. 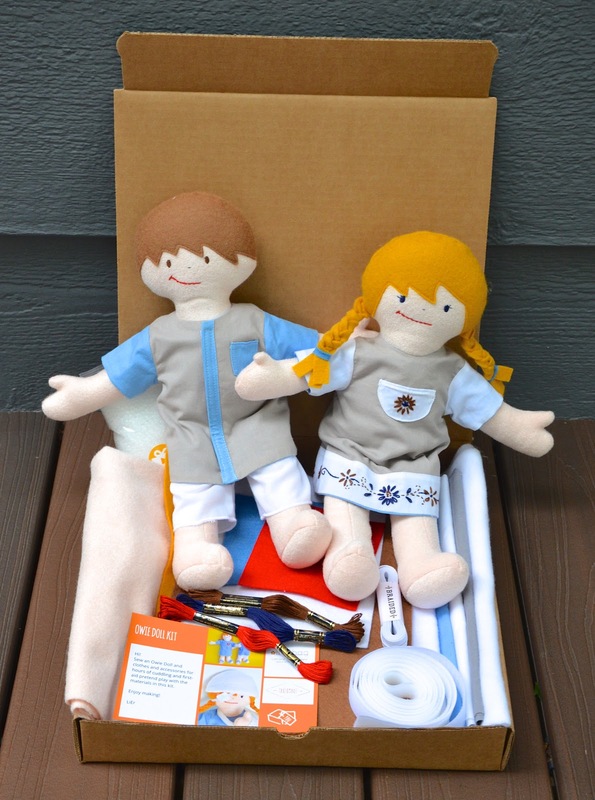 I want the dolls I make to match as closely as possible the person I'm giving them to. So if I'm making them for my family the current kit or a the middle tone is perfect, same with the hair colors (though my daughter wishes there was more of the light brown hair because she doesn't want her doll to have blonde hair). But, if I'm making it for my friend with darker skin, I'd buy that one. 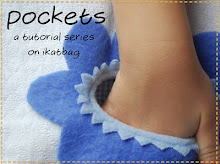 And I already bought the kit with the pattern, so next time around I don't need the pattern. I am wondering if there is a market for a non-flesh colored skin tone--purple, lime green? If a child is trying to "help" another hurting child as a distraction from his own pain or so she doesn't feel so alone in her injuries, I don't think the doll/friend needs to be any particular human color. Come to think of it, the doll/friend could have a tail, cat ears and an eye in the center of its forehead and still be a great toy. I also have three kids, and I feel your feeding pain! One eats, I clean up, the next one comes in to eat. Repeat for the third. By then, the first one is hungry again. And yes, their tummies are miniscule. Look at their fist--that's their tummy size. And if they're eating things like bread, cereal, granola bars, it's going to get digested into sugar very quickly, give them a burst, and then quickly make them hungry again. I try to force protein and fat on the kids everytime they're looking for food LOL.